The Ghanaian leader, Nana Akufo Addo, a great move. I do often criticize our Ghanaian leader, Nana Akufo Addo, but the fact is if one continues criticizing people every time, the good work they do will escape your attention or passed unnoticed. If we have to render to Caesar the things that are Caesar's, I will congratulate Nana Akufo Addo for such an impressive decision which very soon Ghanaians will know its value. Already some Ghanaians have started criticizing, making noise over this remarkable decision. This article will unfold the vital importance of learning French in Ghana, as a second international language. Ghana will never ever develop or move forward if we are not prepared to learn. Education is a master-key which opens all doors and careers. People communicate with each other and convey their thoughts, emotions, mood, and all these are done with the help of words. Everyone wants others to understand him. When you know a foreign language, many opportunities for communication open up. You can learn a lot about different traditions and cultures, you can meet different people. Knowledge of foreign languages greatly expands the capabilities of any person, making him a successful and interesting person. Everyone has his own motivation to learn languages, but there are several main reasons. There are many professions related to the translation of various literature and documentation, which presuppose a good level of proficiency in a foreign language. A large number of foreign companies need foreign partners to grow the business on an international level. To get a job in such an organization, in addition to specialized education, you need to know more than one language and that ability will give you a special preference as a candidate. Knowledge of a foreign language is a prerequisite for entering a prestigious national university and obtaining the opportunity to study and further work abroad. In addition, knowledge of the language will help students participate in cultural exchange programs. Fluency in French will allow you to feel comfortable abroad, which is especially important for lovers of independent travel. This will help you read documents written in the French language when checking into hotels, as well as expanding the circle of friends and acquaintances. Possessing a foreign language, you can make new acquaintances and communicate on the Internet with friends living abroad. The better the knowledge of the language, the more there will be general topics for discussion. If you plan to move to another country, then knowing the language of this country will help you quickly adapt and find a suitable job. Knowledge of the language helps to better learn the features and understand the culture of the country to which it belongs. This will be useful if you plan to stay in that country for a long time or move there to live. Now it’s time to share a short story about my life, over how learning foreign language apart from English, helped me to quickly integrate and find a job in Europe. In the early nineties, I arrived in Rome, Italy, when no one was expecting me. Without any place to sleep at night, I slept at the Central Train Station for many days, eating daily at the Caritas – Charity, managed by the Roman Catholic to assist homeless people. What I realized in the first week of my arrival is, Italians don’t speak English, therefore, to survive in such a hostile environment, I must force to learn the language. I met other Ghanaians who aren’t interested to go to school and learn the language, even though it was free. I did. Within three months, I could write and speak Italian fluently. My ability to speak the language impresses a Ghanaian lady living in Rome for decades to search for a job for me. Shortly, I was employed by a great Italian journalist, as a housekeeper, doing all the domestic work, taking care of two German shepherd dogs and cleaning the swimming pool. I was given accommodation, a car and a salary of one million Italian Lire per month, which was eight hundred and fifty dollars at that time. That’s the advantage of learning a foreign language. Now, I will finalize it with my experience in Belgium. Even though the country is very small, they speak three languages, Flemish-Netherlands, German and French. It is very easy to learn French if one speaks Italian since they are somehow similar. For example, “To eat in Italian is ‘Mangiare, while French is Manger, pronounced ‘Mangey.’ Therefore, I did a course in the Netherlands and got a job very easily. 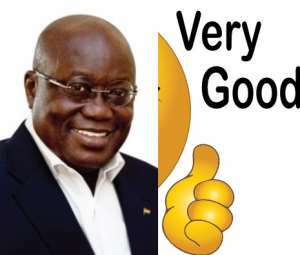 Therefore, fellow Ghanaians, for those who can’t see this great step Nana Akufo Addo has taken to make Ghana a better country; you must consider all the presented advantages and congratulate him. Nana Addo! Congrats.